Wenatchee Valley Glass has partnered with Agalite Shower Doors to offer the Wenatchee Valley one of the premier shower doors on the market. Manufacturing doors since 1952 they have years of experience in the constantly evolving world of shower doors. Agalite has a Limited Lifetime warranty on the Accent, Fresco and Vision Series and a five year warranty on their Estate heavy glass doors. Wenatchee Valley Glass as an installing dealer backs this up with a one year labor warranty. Agalite offers a great value at a competitive price with their Accent Collection. The Accent doors are a semi frameless design offering minimal metal framing and securely fastened hardware that is actually fastened through holes that are drilled in the glass. With the Estate Collection Agalite offers frameless heavy glass shower doors with a myriad of design options. They can do sliding and hinged doors in a complete range of hardware finishes. For those who are looking for a modern more contemporary look they offer the Hydroslide door that actually uses the glass sidelight panel as the structural support for the sliding panel. You can customize the handle options, add towel bars, and choose how you want the stationary sidelight panels installed. Click on the pictures below to see some of the options available. You can also download an Agalite Brochure here. 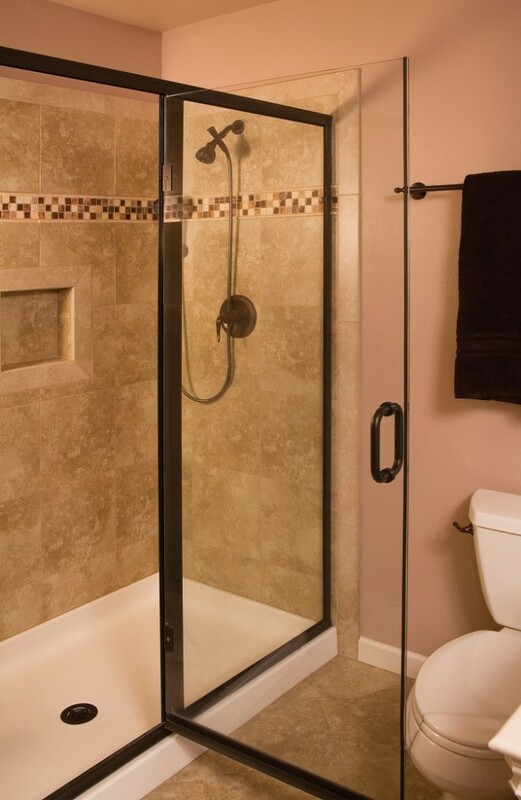 Agalite Estate Series Shower Door with Clear Glass and Oil Rubbed Bronze Hardware. Note the installation of the sidelight panels with U-Channel. Agalite Estate Series Shower Door with Clear Glass and Brushed Nickel Hardware. Note the installation of the fixed panels with clips. Agalite Estate Series Shower Door with Clear Glass and Oil Rubbed Bronze Hardware. Note that anytime a door is hinged of a sidelight panel a header is required.